Arab women grinding coffee in Palestine. First Sunday in Advent, Year A: This historical photograph of Palestinian women preparing food reminds us of these words from Matthew: "Two women will be grinding meal together; one will be taken and one will be left. Keep awake therefore, for you do not know on what day your Lord is coming." (Matthew 24:41-42.) The lectionary passage from Matthew describes the eschatalogical taking of souls, bodily, from the fields, from preparing the day's meal. The gospel writer impresses upon us that ordinary tasks of daily life must be accompanied by a readiness, a watchfulness, to enter Christ's kingdom. 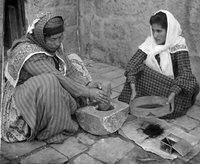 Arab women grinding coffee in Palestine., from Art in the Christian Tradition, a project of the Vanderbilt Divinity Library, Nashville, TN. http://diglib.library.vanderbilt.edu/act-imagelink.pl?RC=53077 [retrieved April 24, 2019]. Original source: http://commons.wikimedia.org/wiki/Image:Coffeepalestine.jpg.